RSBG: 504sd1996 SEH#175:RSBG (0\R1\8). My own collection from 9,200 ft. in NE Yunnan, China. 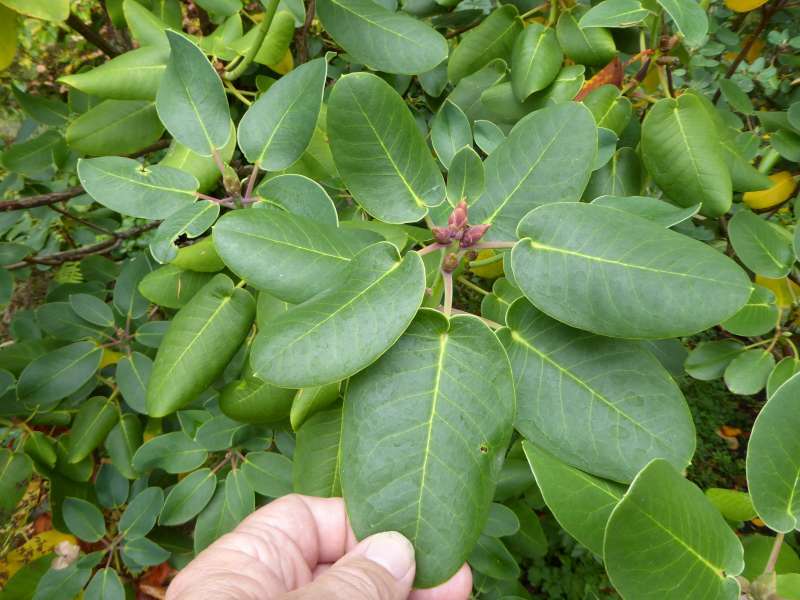 This is an extremely unusual form with rounded cordate leaves very similar in appearance to the foliage of orbiculare. We were quite perplexed in the field but Peter Cox haws since bloomed this and confirmed the identity as decorum! Very distinct population and uniform seedlings. May deserve subspecific status. Large blooming-sized plants. R. fortunei ssp. oblongum/decorum ssp. cordatum "cardiobasis" er i kultur fra 2014 (Glendoick). Arten er blevet forvekslet med andre arters ekstreme variationer. Fx R. decorum ssp. cordatum der har hvid blomst. R. ssp. cardiobasis vokser i det samme område, men ved 1700 m. og ligner lidt disse. As it turns out, those “orbiculare-like” rhododendrons on Dayao Shan are the true cardiobasis, with this very mountain the type location for the original herbarium collection, identification, and naming of that taxon (1929 from the Yao Shan [our Dayao Shan], Guangxi, China). This was mistakenly lumped into the species orbiculare in the 1982 revision of the genus (Notes from the Royal Botanic Garden Edinburgh Vol. 39 No. 2). With increased access to the remote parts of China and continuing observations of the wild plants, it is now obvious (at least to me) that this Dayao Shan taxon has absolutely nothing to do with R. orbiculare, which is known from far to the north and west in Sichuan Province. 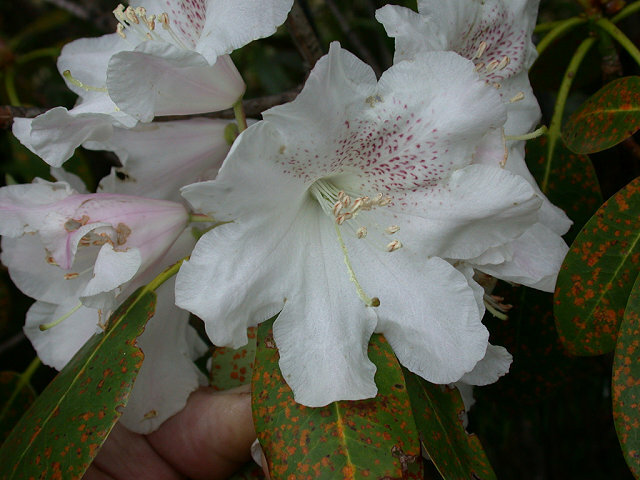 With very little information on which to base judgements at the time of the revision, the round-leaved rhododendrons from the Maoer Shan in the NE corner of Guangxi Province (basically the next large range to our north but with lots of sub-tropical, low-elevation land in between) were assigned to R. orbiculare ssp. 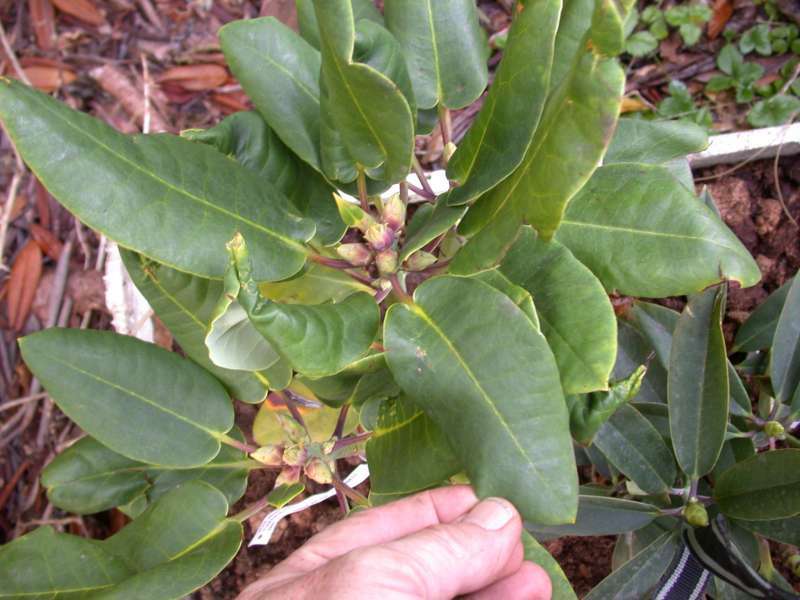 orbiculare with the longer-leaved specimens assigned to the new combination of R. orbiculare ssp. cardiobasis. 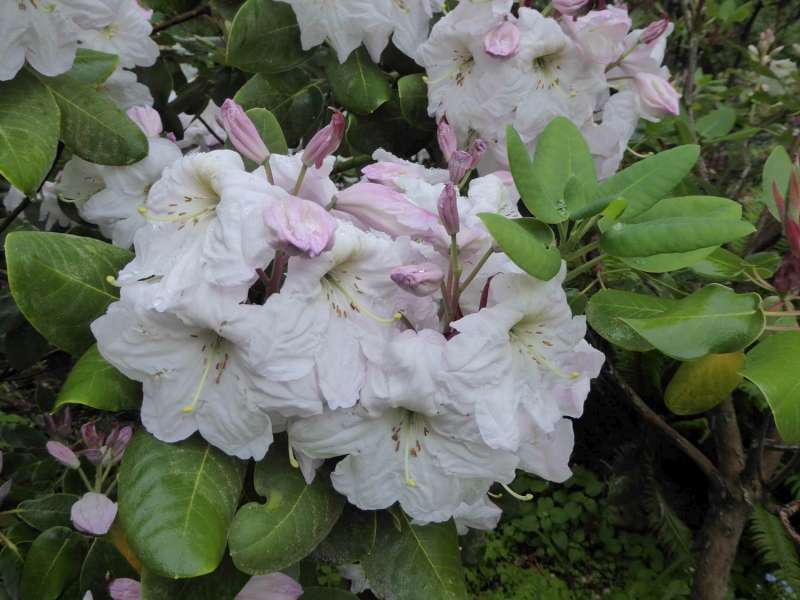 As we now have plants of these “taxa” in cultivation from the Maoer Shan and have flowered them, it is obvious that they are simply variations of a round-leaved form of the widespread and variable R. fortunei with similar somewhat coriaceous, pale or olive-green leaves. They have the same upright inflorescences of pale pink, open to funnel-campanulate flowers in mid- to late May, right in the same time frame as “typical” R. fortunei and several weeks after R. orbiculare, which has completely differently shaped flowers (campanulate). In addition, the growth of the Maoer Shan “orbiculare” is much more upright growing and tree-like as you would expect from the species fortunei. The species orbiculare has a very rounded and bushy habit, usually quite a bit wider than high. On the other hand, the plants we were observing here on Dayao Shan were completely different in growth habit and foliage, with deep green shiny leaves of a thinner texture. What is even more intriguing is that I feel confident that this taxon is not only not closely related to the fortunei entities to the north but is also not very closely related to the recently introduced R. yuefengense, another round-leaved species from the Maoer Shan. 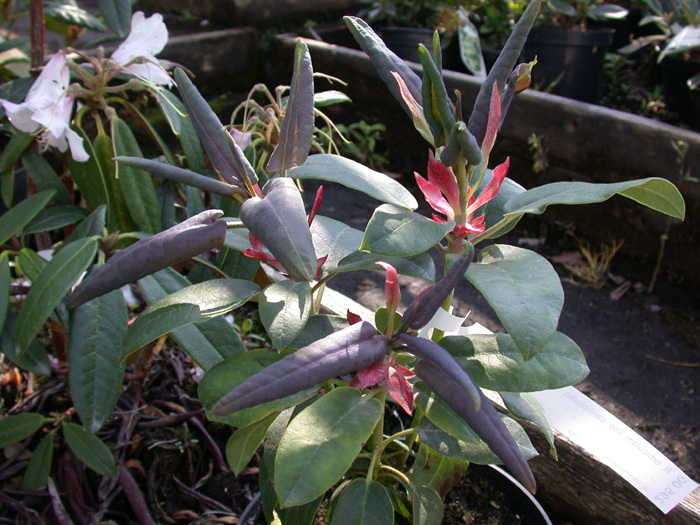 Whatever the true R. cardiobasis may turn out to be within the taxonomy of the genus, it is making a beautiful plant in cultivation with striking foliage and strong growth. We have not yet seen the flowers. I am including a note I have just sent to a friend in Cornwall (Tom Hudson in Tregrehan, a must see collection if you ever have the chance) who was also wondering about this “orbidulare ssp. cardiobasis” It is not that the seed was mis-identified (although that is a very common occurrence with a certain collector who regularly contributes to the RHS and ARS) it is just that the original plants were mis-identified, no fault of the collector or distributor in this particular case. Here is my response: That is a rhody from Maoer Shan. it was brought back by AC among others as orb. ssp. cardiobasis which was logical if you refer to Chamberlain who clearly shows it occurring there. I also have this in flower and it is best considered basically as a round-lfd form of fortunei and has absolutely nothing to do with orbiculare, one of the problems is that the scale of David’s map is too small and he did not have much to work with to begin with, the type for cardiobasis does come from Guangxi but a bit further down in the Dayao Shan where we have seen it, that population/species is quite distinct from the Maoer Shan thing. I think this Maoer Shan taxon needs a new name, prob. as a subsp. of fortunei . I think that cardiobasis probably has nothing to do with orbiculare and should be reinstated as a full species but we will need to see the flowers. This all makes more sense when you consider orbiculare is basically a Sichuan plant. 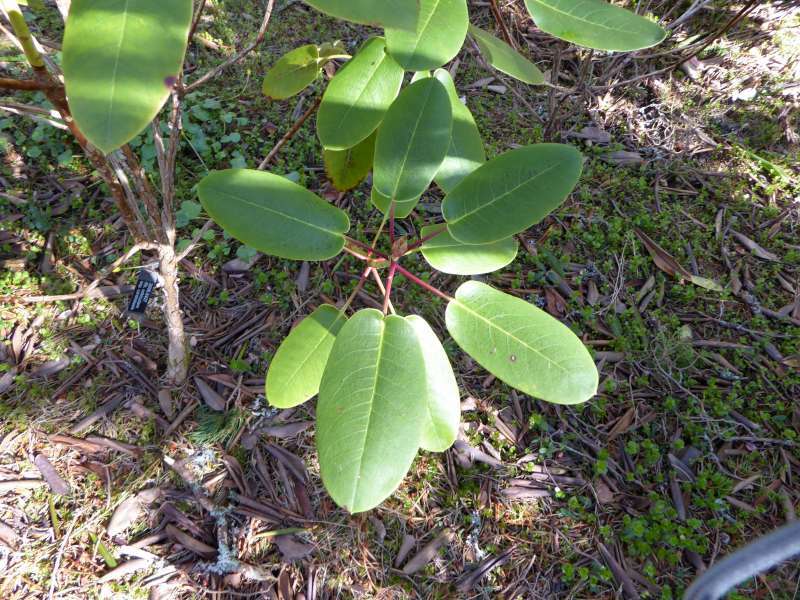 I have four young plants of the Dayao Shan cardio which is quite different, no flowers yet. You remember we also saw two plants on Daming but no seed, that is one mixed up and unknown group of plants, I am still hoping to have a look at Maoer Shan myself sometime to help me sort out the mess. R. maoerense (PW collection) bloomed this year as well, another enigmatic plant but quite lovely.